A limited liability company is a business operated by one or by several owners, called "members." If the LLC has only one member, it is taxed as a sole proprietorship. If the LLC has two or more members, it is usually taxed as a partnership (or it may elect to be taxed as a corporation). This type of business is considered a "pass-through" entity because the taxes of the company are passed through to the owner or owners on their personal tax returns. Federal Income Taxes: The LLC business form is not considered a taxing entity by the IRS, so an LLC pays federal income taxes based on the number of members and the profit/losses of the LLC are passed through to the member tax returns. Single-Member LLC Taxes: The LLC is considered a disregarded entity and the net income of the business is calculated on a Schedule C from the individual's Form 1040 for federal income taxes. The Schedule C profit or loss is added in with other income by the owner and spouse, to determine the total amount of income tax payable by the sole proprietor. First, the partnership files an information-only return on Form 1065 and submits it to the IRS. Then each partner's share of the profit or loss of the partnership is recorded on a Schedule K-1. The K-1 information for each partner is reported on Line 17 of the partner's Form 1040. Most states use the federal information to determine total income for state tax determination. Election to Be Taxed as a Corporation: An LLC is also eligible to apply to be taxed as a corporation. Usually, this election is done if the tax structure would be to the advantage of the company. The election is submitted on Form 8832 - Entity Classification Election. Self-Employment Taxes: LLC members are considered self-employed individuals (not employees). Each member must pay self-employment taxes based on his or her share of the income of the LLC. Self-employment tax is included in each member's Form 1040 for federal taxes, calculated using Schedule SE, and the total self-employment tax liability is included on line 57 of Form 1040. Other Employment Taxes: If an LLC has employees, the business must pay employment taxes, including withholding and reporting federal and state income taxes, paying and reporting FICA (Social Security and Medicare) taxes, worker's compensation taxes, and unemployment taxes. Property Taxes: If the LLC owns a building or other real property, property taxes are required to be paid on this property. 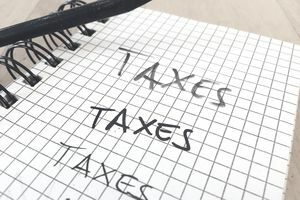 State Sales, Excise, Use, and Franchise Taxes: Limited liability companies are required to pay state sales taxes and excise taxes in the same manner as other business types. Check with your state department of revenue for more information on sales and excise taxes. Limited liability companies are not typically liable for franchise taxes, as these are levied by states on corporations.